The front trunk lighting, like most car trunks, is rather dim partly because everything is black. With this modification for pre-refresh RWD cars, we’ll add a strip of lights inside the back box “cubby” portion of the frunk. All AWD cars and refreshed cars (made after April 2016) do not have a cubby. For pre-refresh cars also so see our hood mounted LED project for additional lighting! This adds considerable light to the cubby and the main part of the frunk. The project takes about 60 minutes and the parts cost is under $40. You may want to read through all the instructions to see if you feel up to doing this project and look at the result photos at the end. If you’ve already made our trunk lighting modification, you should have almost everything you need with the excess parts from that project. This is also an easier project, but may require getting into the frunk briefly to attach the LED strip, an awkward maneuver at best! There are many ways to do this project, but we’ll outline the way we did it. You can improvise and/or elect to do it differently. A ten inch length of 5050 warm white LEDs waterproof, 60 LEDs/m, 12 VDC (cut from longer strip). There are many vendors, lengths, LED density and color choices at eBay, Amazon and others. (I bought this 5 meter strip from eBay for another project, but this is far more than you’ll need for this project). Select Warm-white or natural white and waterproof. You can cut LED strip as marked to the desired lengths. Tesla uses cool white (about 5000K) LEDs, but I find the warm LEDs to look better (about 3000K). There is not a huge difference and its only a personal preference which shade of white you use. 6′ Male 2.1mm Plug to Female 2.1mm Jack CCTV Power Cable – We’ll cut this to provide the wire and a barrel connector pair. If you do a substitution, make sure the wires are not a shielded round cable – it needs to be a zip-cord style wires – 18-22 AWG. First cut the power cable, with the female end having about 3″ of length (this is the connector end that is mostly covered in plastic). With this female connector portion, you’ll need to connect the wires and connector to the LED strip. Pre-wired method: If your LED strip was pre-wired, you could use the solderless connectors to join the wires. The red wire will go to the white marked wire, and the black to black. If there are no wires attached, you’ll need to either use a quick connector or solder the wires to the LED strip. Quick connector method: Determine to which end of the strip the connector should be attached. This is important, as one side will fail to work because the polarity will be backwards! The positive connection which connects to the center pin of the barrel connector goes to the plus “+” marking. The negative connection which connects to the outer sleeve of the barrel connector goes to the minus “-” on the strip. Before attaching the quick connect, we recommend removing 1/8″ of the adhesive tape from the back at the end. Make sure the copper dots are not covered with adhesive, as our experience is you’ll only be successful about 30% of the time if they are not cleaned first. Go ahead and attach the connector. We are not fans of using the quick connector in vehicle applications. The connection is not as solid as soldered connections. Given a car’s harsh vibration and temperature environment it may become intermittent, but this is only our conjecture, and it may be fine for years. Solder method: You should have a quality soldering iron, design for electronics work. First carefully remove the silicone waterproof coating from the top of the LED strip about 1/8 from the end of the strip (where you should see two tiny copper connection points. You need to remove all the silicone coating from the copper to enable soldering to it. Solder the red or white marked connector wire to the + dot on the LED strip and the black wire to the – dot. If you make a mess of it, just cut another 6″ LED strip and try again. You should have lots to work with. Cover the connection with the heat shrink tubing and shrink the tubing either with a heat gun or lighter (be careful not to melt the wires or LED strip). Now you’re ready to work on the car. Open the frunk. If the optional cargo net is attached, remove it. Remove the two back plastic net holders from the passenger side (they unscrew easily by hand). Over the cubby area (the area closest to the center of the car), there is a 20″ wide carpet coated U shaped plastic panel. Grab the bottom and swing towards the front of the car and up. It’s attached with Velcro, but all the pads for me pulled off the plastic. Not a big deal, and it will go back on fine later on. Remove the bottom carpet liner. The frunk tub liner fits into a groove in side of the cubby (next to the two cargo net screws). Starting at the top pull the side of the tub towards the front of the car and work down until it is completely out of the groove. The bottom is a little harder, but not too bad. 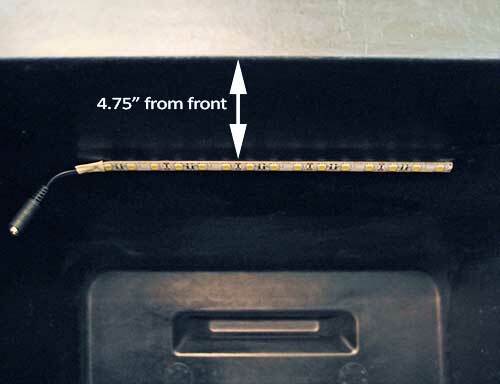 With the remaining male barrel connector and 5′ 9″ of wire, leave the barrel connector and about 4-5″ at the top-passenger side of the cubby and route the wire down behind the tub, and along the bottom around to the front. Tuck it up under the tub liner as you go around so it doesn’t rub between the bottom of the liner and the floor. You don’t have to go all the way around yet, as the next step – removing the frunk-latch cover will make it easier to complete. Carefully remove the plastic frunk-latch cover that holds the existing LED light and trunk release button. It slides straight up (there are two press-fit plastic screws in the front that should lift out as you pull the assembly up. Do not loose these black plastic screws! There are wires attached so don’t pull to hard – it only needs to move up about one inch to release. At this point other than the wires it should be completely loose. 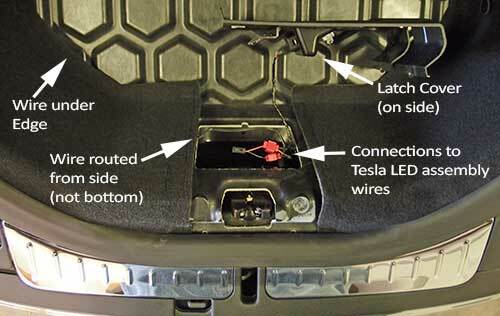 You should then have enough room to get in and disconnect the two wires from the Tesla LED assembly. You have to depress the connector locking tab before sliding the connector out. You can leave the frunk release button wires attached. Lay the panel on the frunk bottom for now. Complete routing the wire around the tub bottom so it comes out at the latch cover. Again check that it tucked up under the lip of the tub and the tub is not resting on the wires. Looking at the two wires from the Tesla LED assembly, there may be some wrapped electrical tape around the wires. You’ll need to remove some of this to leave 2″ of wire uncovered so we have room for the the wireless connectors. If cutting it the tape off, be very careful, as you don’t want to nick the wires. Next using the wireless connectors, connect the white wire to the red Tesla wire, and the black wire to the black Tesla wire. Leave at least 1/2″ of wire as shown before the black Tesla LED connector, or the connector will not fit back on the LED assembly! Time for a test. Reconnect the Tesla LED assembly to it’s black connector. By now the frunk light has turned off. Close the frunk and re-open it. The Tesla LED should be on. Next temporally connect the LED strip to the barrel connector and confirm it works! If good, remove it until we put most parts back in place. If the new LED strip does not light, either a poor connection was made, or the polarity is reversed. Pull lightly on your new wires attached to the red quick-connectors. If you didn’t push the wire fully in before clamping it closed, it may pull right out indicating a bad connection. If so, redo the connection (it splits apart easily). If the connections seem good, verify the polarity by checking the wire colors and/or using a meter up at the connector near the LED strip. Rewire as needed. With the new LED strip tested, reattach the frunk-latch cover. Make sure your new wire comes in from the side, as the cover has a hook on the back bottom that could pinch the wire. Hook the bottom on and put back into place. Push in the two plastic press-fit screws to hold in the top. Back near the cubby, pull the tub forward enough to slide it back into the groove at the side of the cubby. Put back in the carpet and screw back the two plastic cargo net holders. The plug should be hanging out at the top. The top of the cubby area is hard to work on and hard to get a good alignment by eye. First wipe any dust from the ceiling area where you’ll be attaching the LED strip to make the best bond. My car was quite dusty in this area from the factory. Option 1: Mark the placement of the LED strip using a tape measure and a silver Sharpe or other marker that works on black. On the cubby ceiling place one mark 4.75″ from the drivers side of the cubby and 4.75″ from the front of the cubby. Place one more mark on the other side, 4.75″ from the front and 4.75″ from the side. Option 2: In retrospect, skip the marks and make a template out of scrap cardboard and tape it to the top and driver’s side. We mocked up how this would appear if you were upside down looking at the cubby roof. With the template, you may not have to crawl into the frunk and work upside down (somewhat of a pain). I used blue painters tape to hold the template in place. Remove the backing tape on the LED strip and starting with the mark/template on the driver side and the LED strip side without the connector and attach it to the cubby ceiling and across to the other mark. Press firmly along the strip so the adhesive bonds with the plastic. Remove the template. Connect up the LED strip. Reattach the U cover that goes over the cubby and top area. Fit the cord and connector inside the cover bottom. Now enjoy your new lights! The photo below give you a rough idea of the final results with and without the lights. These photos were taken while dark outside. Photo brightness was adjusted in Photoshop to better reflect real views. The lights are only on when the frunk is open, so they have no effect to range. The light strip used here consume about 3.7W. Also consider adding our hood mounted LED strip for more frunk lighting! I did this modification, but slightly different. I have a 2014 Model S 85, and the inside frunk latch is different than pictured. My frunk has a single LED which was easily removed. It had short wires attached, and I disconnected it, pulled the wires through a little, then stripped each wire. I then added two Alpena LED spot lights (see http://www.autozone.com/exterior-lighting/led-light-pods-and-lighting-kits/alpena-led-spot-lite/111799_0_0) and placed them at the bottom of the plastic frunk-latch cover that holds the existing LED light and trunk release button. I also soldered in a long length of 16 gauge wire which I then ran around under the tub liner to the well and tucked it under the sides and up the inside of the plastic piece in the front of the well. This wire I connected to a 15 inch white LED strip that I stuck up under the top of the well. When completed, the frunk lighting is now very bright. I have some iPhone photos that don’t do it justice. I’ll have to take some better photos and upload them to the site. (How exactly do I accomplish that?). Next: onto the trunk!